In 2007 the oil sector accounted for over the half of the country’s GDP. Last year 62% of FDI went to the oil industry. While the non-oil sector is reported to grow by 15.6% during the first half of 2008, the oil sector remains the major source of budgetary revenue. The IMF has warned previously that the growth rates in Azerbaijan are expected to decline significantly after 2010, once oil production passes its peak period. Even though this forecast was later refuted by some experts, who believe that the oil potential of the deep-water oil fields has not been fully explored yet, the importance of development of the non-oil sectors is widely recognized. The decline of oil production will directly affect the revenue from the tax collection. 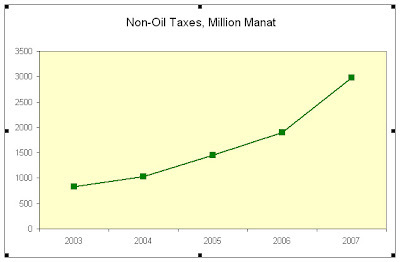 Although the non-oil tax revenues have been steadily increasing since 2003 (see the chart below), the collection level still is below its potential. Several reforms aimed at modernizing the tax administration were implemented. Still, the wide-spread underground economy adversely affects the level of tax revenue. To broaden the tax base, the IMF recommends to reduce tax exemptions and benefits, and to make the tax privilege procedures more transparent. Also, to increase compliance, tax regulations, as well as all instructions and forms must be simplified and made easy to understanding of all taxpayers. The author of the report also recommends to reduce direct tax rates and to apply a unified rate to personal and corporate income. Tax and custom administration in general must be strengthened. The paper is available at the IMF website.